This is also the study by the Kyowa Hakko research laboratory. It is great that the drug maker’s paper was adopted by the British Journal of Dermatology. It was published in 2007, when it was being revealed that the rebound phenomenon is deeply related with the epidermal barrier disruption through long-term topical corticosteroid application. I guess Kyowa Hakko tried to verify the effectiveness of ALLELOCK (olopatadine) with the experimental animal model. Each mouse ear was tape stripped (repeatedly applying and stripping the tape to remove stratum corneum) and TEWL (transepidermal water loss) was measured. Setting the damage level before stripping at 0% and that immediately after stripping at 100% (0% recovery) to monitor the recovery level 1, 3, 6, and 9 hours later. 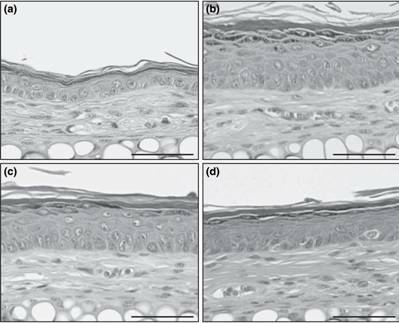 It was known that topical corticosteroids delay the TEWL recovery and olopatadine was administered internally to see if this could improve this TEWL recovery delay (epidermal barrier disruption by topical corticosteroids). Veh represents vehicle, and Beta stands for betamethasone (topical corticosteroid). The group to which topical corticosteroid was applied was late in TEWL recovery (■-line). The recovery rate was a little improved by internally administering olopatadine, and olopatadine was confirmed effective for alleviating the adverse effects of prolonged use of topical corticosteroids. It was proved that taking ALLELOCK internally during topical corticosteroid application could not only suppress itchiness but also inhibit addiction (rebound). But this was only proved in the experimental animal model with mild steroid addiction and it is another story if this is also effective for strongly addictive patients seeking withdrawal from topical steroids. What is certain is that reliable data collected by a drug maker are really encouraging for clinical doctors. Repeated tape stripping leads to epidermal cell hyperplasia, which results in thickening of the epidermis. Sham represents the control group without tape stripping DW represents the group that was tape stripped and then given water, and Olo represents the group for which olopatadine was used internally. Olopatadine seems to accelerate the recovery of TEWL and also suppress the epidermis thickening following stratum corneum breakdown. Reporting the above results, I’ve begun to feel as if I was a medical representative of Kyowa Hakko. It’s very encouraging for dermatologists and beneficial for patients that drug maker researchers have become aware of the phenomena of side effects due to long-term steroid application and begun to verify if their products are effective to overcome such side effects. I think such a company is also fulfilling their social duties while prioritizing profits most. I respect the Kyowa Hakko researchers, whom I’ve never met though. I’m not advertising ALLELOCK at all. I just want other pharmaceutical companies to disclose basic data of antihistamine/antiallergic agents for effectiveness against addiction or rebound so that clinical doctors can make use of them. Why is antihistamine like ALLELOCK (olopatadine) effective to protect the barrier? The above bar graph compares the histamine content of murine ear tissue between the tape stripping group and the normal group without tape stripping. It can be seen that tape stripping raises the histamine content. Histamine might be a contributor to delay the recovery of TEWL or cause epidermal thickening. If so, antihistamine might have a universal effect for barrier protection. Some day, the following instructions may be added to medical text books: Antihistamine should be used in combination with topical corticosteroids to protect the skin barrier; or systemic antihistamine should be continuously administered to patients who’ve discontinued topical corticosteroids after getting addicted in order to replenish the barrier and mitigate the rebound phenomenon.